My favorite part about fall in the southeast United States is the weather (perfect for mountain biking) and the colors. This year we have an unbelievable amount of fall reds and yellows. I believe this is due to some good rain that we got right before the turn. On a ride at Fort Yargo over the weekend, I took some time before the ride to walk around with the wife and our dog. 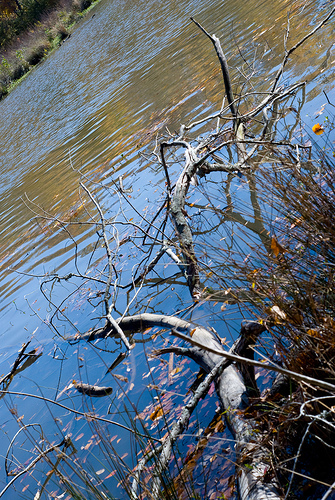 This shot of the lake with the fallen leaves really caught my eye. The clarity of the air a day after a hard rain is incredible. Add to that…the yellows of the leaves on dirty lake water make for a great shot.